« Tear Down This Wall! Traditional youth ministers work themselves to the bone to hold their ministries together “with Scotch tape and paper clips” while at the same time ignoring the most powerful resource they may have–teenagers’ parents. We can no longer continue to view parents as neutral factors in our ministry to their teenagers. Parents, simply by the way they raise their children, will either empower our ministries or sabotage them. Parents play a role second only to that of the Holy Spirit in building the spiritual foundation of their children’s lives. During the last century, church and parachurch youth ministries alike have increasingly (and often unwittingly) held to a single strategy that has become the defining characteristic of this model: the isolation of teenagers from the adult world and particularly from their own parents. Traditionally, success in the youth ministry has been measured by participation statistics, by whether the teens enjoy the programs, and even whether the teens commit their lives to Christ–but without evaluating the long term retention of these teens in their adult lives. Unfortunately, as an inherent consequence of separating the teens from the adults, they receive limited preparation for adult life. Their understanding of adult spiritual life comes from memories of a room full of adolescents being entertained by a dynamic young youth minister. That picture is inadequate to support them through the struggles they will face as adults. Statistics confirm the bleak picture that youth ministries in general are not getting the job done, from the long term perspective. 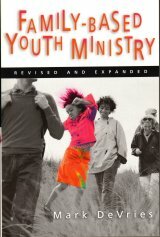 In this book Mark DeVries advocates a different approach, in which the youth ministry is built on the foundation of parents and other spiritual adults. In his approach, primary responsibility for the spiritual formation of the children is given, not to the youth minister, but to parents. Focused help is given to the parents to empower them in carrying out this responsibility. And deliberate steps are taken to build relationships between teens and other adult members who can be mentors and encouragers as the teen navigates the transition to adulthood. DeVries addresses the difficult nontraditional family situations that are becoming more prevalent–blended families, single-parent families, and families with spiritually weak parents. Especially in those situations, mentors outside the family are a crucial part of the extended family that is the church. This extended family works to provide what is lacking in the immediate family unit to help the teenagers develop a healthy vision of spiritual adulthood. Reading this book, I couldn’t help thinking that the phenomenon of the traditional youth ministry, isolated from adults, is a smaller piece of a larger problem. My wife and I noticed the same thing happening in campus ministry a few years ago. At this stage of life, students are living away from their parents for the first time, and are wrestling alone for the first time with roommate issues, with managing their own finances, with finding a career, and with dating and marriage. They are deciding who they want to be as adults. This is exactly the wrong time to be separating them from the older spiritual adults whose examples and decades of experience in those areas can make all the difference in the students’ search. College students need older adults as mentors. And based on my experience, they are hungry for those relationships. They love the adults who guide them away from dangers and toward the right path. We often make the same kind of mistake with adult singles, young marrieds, families with small children, etc. I believe we do so to the detriment of the future of the church. God designed the church as a family. The older men and women should teach the younger men and women how to live a godly life, both by example and by word. That goes for every stage of life, but none are more critical than the teen and college stages. This book provides more than theory about adult involvement with teens. At the end of each chapter there is a list of “Implications for Ministry” and a “Wild Hair Idea” to get started implementing the concepts from the chapter. This second edition (2004) of the book includes a chapter titled “Making it Work” and appendices with implementation ideas, and even a curriculum to help parents connect with teens. This is an eye-opening book. It just might be the start of a new era in your youth ministry–and perhaps even beyond. That sounds like a great book. As of right now, we are not participating in youth activities unless the entire family is welcome.Have you read “A Critique of Modern Youth Ministry”? Can’t remember the author and I have loaned it out. It sounds similar to the book you mentioned.